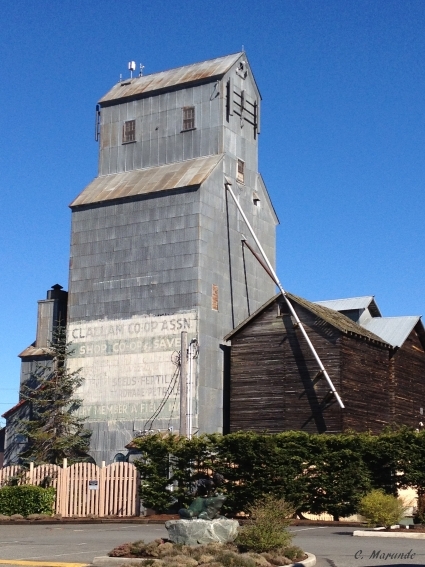 The Sequim grain elevator is a Sequim landmark. I couldn’t resist this photo today, which was a beautiful sunny Sequim day. The Sequim grain elevator sits right downtown in Sequim surrounded by businesses, but in the early years there wasn’t much around the grain elevator, except the railroad tracks. The first structure built on this site was a storage facility for lettuce built by the Peninsula Grain Company. In the 1920s this was a delivery and transfer station for local farmers who sent their produce to the Seattle metropolitan area. In 1935 Cecil Dawley purchased the building. The word is Dawley ran his feed and farm equipment business until 1941, and then he leased it to the Clallam Co-operative Association. The Clallam Co-Op operated the business from the mid-1940s through the mid-1970s. Now the building is a Mexican restaurant called El Cazador. The structure now also serves the area as a multi-purpose communications tower, including a Verizon communications center. In the ’50s and ’60s 40 tons of grain was lifted by belt to the top and dropped into railroad cars every day. The Sequim grain elevator, aka the granary, has walls made of one inch by ten inch wooden planks. They are stacked horizontally to create a solid wall of wood 10 inches thick and incredibly strong. No wonder the building is still standing proud and erect. In the decades following WWII, Sequim farmers produced seed for cabbage, beets, mustard, carrots and other vegetables. The Sequim-Dungeness Valley was a thriving farm community, and there were at one time over 200 dairy cattle herds in the Valley. Somewhere along the way the price of milk was not keeping up with costs and farmers looked for other opportunities. Today there are only two dairy farms left. Some creative farmers discovered a little gold mine in the late 1960s in the form of high-quality grass seed that was especially prized for golf courses. At one point the Sequim-Dungeness Valley had the largest production of bent grass in the U.S. These farmers started the Dungeness Agricultural Supply, which bought the Sequim grain elevator in 1969. The Sequim grain elevator ceased operations in 1977 ending a treasured bit of local history. Now you know the precious history of the Sequim grain elevator when you drive past it or when you see it on the city’s horizon. One Response for "Sequim Grain Elevator"